The Economist – Nov 7, 2016 – WANTEDLY, a LinkedIn for Japan’s millennials, would not be out of place in California. The thriving firm’s offices feature trendy furniture and a ping-pong table. Akiko Naka, the 32-year-old chief executive leads a young team that forgoes the usual black-and-white attire of Japanese business to pad around in jeans and socks. Meeting rooms are named after characters from a famous manga comic. Mr Abe has made it easier and faster to start a business, and things have improved modestly. Venture capitalists, for example, stumped up ¥92.8bn ($900m) in the first half of this year, up from ¥76.5bn in the same period in 2015. A stronger stockmarket means initial public offerings are more common. A few promising companies are emerging, mainly in life sciences and biotech. Spiber, one such firm, makes new materials from proteins, such as a super-strong silk similar to that spun by spiders. Far more needs to be done, especially about risk aversion. Most Japanese are afraid of failure. Tamako Mitarai, who set up a firm selling knitwear made by people affected by the 2011 earthquake and tsunami in Tohuku, says she wanted to inspire people who had lost their livelihoods with the hope that they would follow suit. Yet five years later, few have done so. “It doesn’t have to be like this,” says William Saito, an entrepreneur turned government adviser, who adds that Japanese companies carried on funding him when he was setting up businesses and failing on the west coast of America. “This is not about something in the Japanese DNA, but about social structures,” reckons Jiro Kokuryo of Keio University. The main problem is an inflexible labour market. Although the system is loosening a little, Japanese companies value and reward lifetime service. The typical salaryman slowly working his way up the company ladder remains an alluring role-model for graduates, and people are unlikely to hop from company to company. This makes it hard for startups to attract mid-level people—hence, says Ms Naka, all her fresh-faced employees. Wantedly provides a forum for businesses and jobseekers to find one another. But Ryo Ishizuka of Mercari, an online peer-to-peer Japanese marketplace that has expanded to America, says it is hard to fire people, which makes life difficult for startups as they grow and evolve. 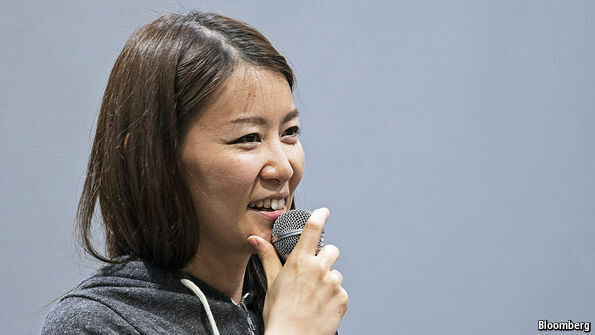 These things may account for why young women head many of Japan’s successful new businesses. “They already face problems of upward mobility in the workplace, so they have less to lose by going it alone,” says Mr Saito. It needs to be easier for companies to close, too. Only 12% of Japan’s small- and medium-sized firms are under five years old, compared with 33% in America. Old companies are kept on life support, sometimes with government assistance, impeding new ones from starting. Established companies also receive more attention than startups from government schemes designed to help small firms, such as R&D tax credits. Meanwhile, too much of the burden falls on individuals if their firm goes bankrupt, as banks—the main source of financing—demand onerous guarantees. The government could also do away with a host of regulations that restrict or ban many of the most popular forms of startup. Uber operates only luxury cars in Japan, not its regular service. Airbnb’s room-letting takes place in a grey area. That is a shame, says Mercari’s Mr Ishizuka, as consumer-to-consumer businesses have most potential in Japan. As the costs of starting a business fall, and the security of lifetime employment becomes harder to find, it is a good time for Japan to tackle these issues. The GEM numbers suggest that although the overall appetite for starting a business may be small, 19.5% of Japanese who believe they have the ability set up a firm actually do so, which is more than Americans manage at 17.4%. Japan has the potential, but its entrepreneurs need a break.